The resolution will then go downstairs to the full City Council at 3:30 pm item #55 on the agenda). With all the upcoming membership changes on the Council, the City and RDC are pushing the project along for quick approval before the turn-over, and the resolution is expected to pass. The RDC hopes to put the work out for bid shortly after the first of the year and to start work in early spring. The RDC has completed work on a new computer-generated "3-D" video of the project. One of our members got a sneak preview at the recent RDC board meeting. He says the video is remarkable in that it is actually an eye-level walk-through. For the first time, Memphians will get a chance to see the view as if standing within those pods. The RDC promises to have the video on their website soon. It will probably be shown to the committee or the full City Council Tuesday. That might be an extra incentive for Memphians to attend. The latest drawings of Beale Street Landing are not on the RDC website yet, but you can see them in the FfOR library. Click here. For an explanation of the revisions, click here. Interestingly, we also learned at the RDC board meeting that there is already $6 million set aside for restoring the Cobblestone Landing. We'd like to see the City start doing it instead of just talking about it. Mayor Herenton promised us the Cobblestone restoration in June, 1995. The City developed a preservation plan in December, 1995 (you can download and read it), pursuant to a Memorandum of Agreement with the Army Corps of Engineers and the Tennessee State Historic Preservation Office. 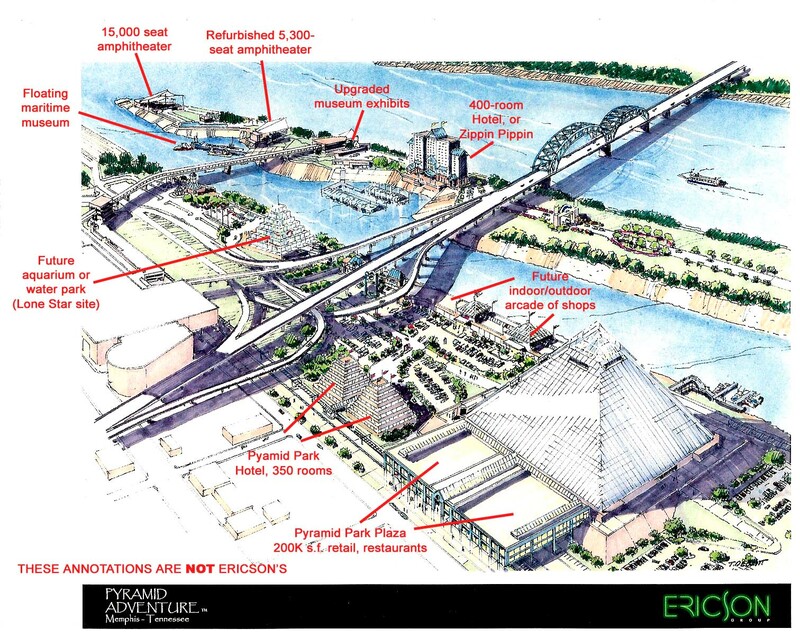 The 2002 Memphis Riverfront Master Plan reiterated the central importance of the Cobblestone Landing. Why has nothing been accomplished in over a dozen years? 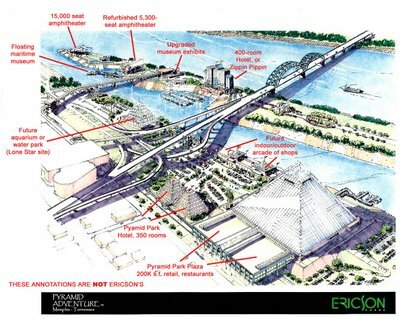 In other news, you have probably heard about the Ericson Group's proposal for the Pyramid and Mud Island. Their plan for a theme park inside the Pyramid is not new, of course. What is new is that they want to take charge of Mud Island River Park as well, rehabilitating what's already there and adding: a second, 15,000-seat amphitheater on the Island tip; a floating maritime museum in the harbor; and a hotel (or possibly the Zippin Pippin) where the Memphis Belle pavilion now stands. Mud Island River Park would be renamed "Harbor Island." The Pyramid complex would include 200,000 square feet of retail/restaurant space over the tracks adjoining Front St, and another hotel if the the I-40 ramp at Jackson Street can be removed or reconfigured. Longer term plans might include an aquarium at the Lone Star site, and an indoor/outdoor arcade connecting back to the Pyramid. Contrary to rumors, there is no land bridge or lake in the plan. Greg Ericson told the County Commission that his group wants to buy the Pyramid site outright, and build all of this entirely with private investment money. Officials from two investment groups representing commitments of $250 million attended the hearing last Wednesday. Ericson's concept drawing of the plan is reproduced below. We've added our own annotations in red to help you decipher it. Click the drawing to enlarge it. Drawings of the Pyramid Adventure theme park can be found on Ericson's site. Take a look and let us know what you think. Some of the ideas are intriguing. Who wouldn't like to see Mud Island River Park brought back to life and open year-round? And the Pyramid, we're all rooting for a good new use for it. One question is whether in this plan, Memphians would still have free access to their own public park on the island - and to how much of it? We look forward to further details and the government's due diligence.